Almonds and pistachos in the market are grown mainly in Iran and California. They are cheap and tasteless (read here why). On the other hand, the Pistachos from Bronte and Almonds from Noto are the highest expression of these nuts. I’d never met Concetto Scardace, the almond farmer from Noto, before; he had no idea who I was. I asked him whether he knew Corrado Assenza of Caffe’ Sicilia. His reply is in the video above (click on the arrow): does he know Corrado? His face opens in a beautiful smile and he starts his rant: He LOVES Corrado!!! Corrado is among the few producers who buy only the real thing, the authentic sicilian products. Corrado only deals with the producers, never looks at the prices and only wants the best real pistachos and almonds. Viva Corrado Assenza!!! He is the acclaimed pastry chef, praised by best chefs all over the world and food authors in Italy and America. Read here what the Los Angeles Times said about Corrado’s Nougats, the other day! 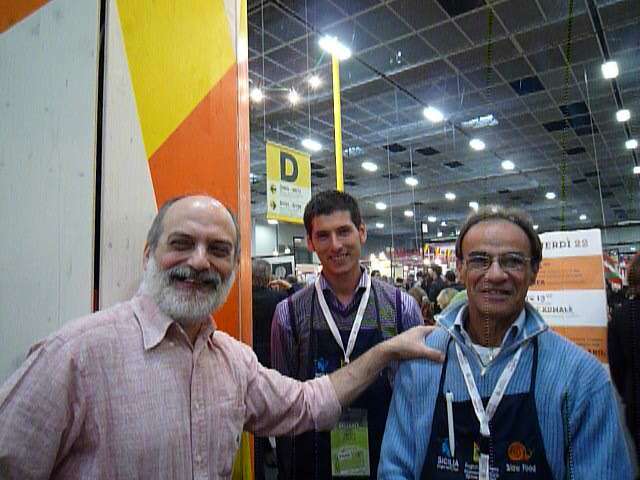 After the interview with Concetto, I told Corrado was also in Torino, at the Salone del Gusto. It was like I told him The Almighty was there, too!!! Here, Corrado Assenza, happily standing with his good friends: Concetto Scardace (middle) and Giuseppe Carbone (right), both farmers and representatives of the Slow Food Presidium Almonds from Noto and Pistachos from Bronte. Grazie a tutti! Next Post Why You Have Never Heard of Olive Oil from Molise, Before?